It seems like all kids, from toddlers to teens, are obsessed with “galaxy” colored things right now. Everything from galaxy messenger bags to galaxy bedding. My own children are no exception, they are obsessed with all things space and starred. In fact my youngest son’s bedroom is going to be space themed (when I get around to painting it!). So when I was browsing Pinterest and saw some awesome Nebula Jars by MomDot, I knew I had to give them a try! Below are my instructions on how to make your very own Nebula in a Bottle! Why am I calling it a ‘Nebula in a Bottle’ and not a ‘Galaxy in a Bottle’? Well, it might be the teacher in me or the science geek. But ‘galaxy’ isn’t really the correct term for the effect that these bottles give. 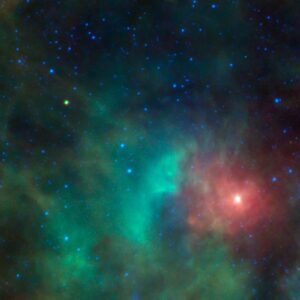 The colorful, almost cloud like, photos from space that NASA share with us are nebulae. A nebula is made up of interstellar dust and gases. Galaxies on the other hand are massive clusters of stars. So ‘Nebula in a Bottle’ it is! 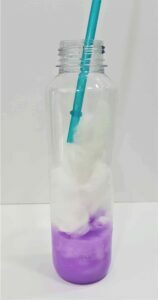 These instructions will take you step by step through the process to make your Nebula in a Bottle. Please feel free to customize it however you want – try different color combinations, glitter, container and more! 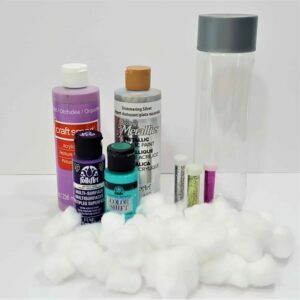 All the supplies for this project are easy to get. I recommend getting them from Amazon so you don’t have to spend half a day driving around trying to find everything! Also Amazon is by FAR the cheapest place to by Voss Water. My local grocery store charges nearly twice as much! 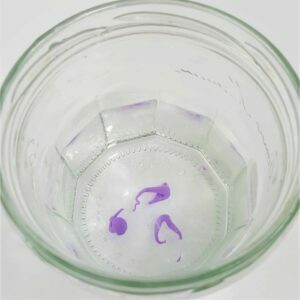 In a separate container mix together about 1 cup of water with 2 or 3 drops of acrylic paint. Also add a pinch of fine glitter. You want the water mixture to be slightly transparent, so don’t add to much paint or it will be too opaque. Pour the colored water into the Voss Water Bottle to about 1/4 full. Tip: I used Voss Water Bottles because I like the clean and sleek look of them. Feel free to use any watertight clear container that you like. The water is also, in my opinion, the BEST tasting water! So I get a treat of gorgeous drinking water before doing a project! Win-win! Next you want to gently pull apart the cotton wool balls to make them slightly fluffier. Using a stiff straw or spoon handle, prod the cotton wool down into the water. Tip: You want to make sure you use a LOT of cotton wool – really pack it down. The cotton wool is what helps keep the layers of color separate. Otherwise they will end up all mixing together. Using the separate container again, mix together 1 cup of water and a few drops of the next acrylic paint color you want to use. Add a pinch of glitter and mix well. 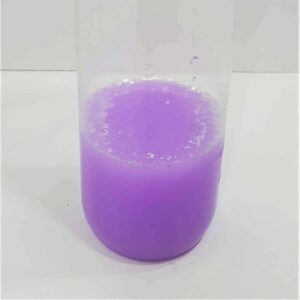 Carefully pour this new color mixture into the bottle. Add more cotton wool balls, packing it down with the straw or spoon handle again. Repeat these steps with different colors until you have filled the bottle. Screw on the cap. Note: Please remember this is NOT a sensory or calming bottle and it is NOT designed to be shaken. If you shake it too much the colors will all mix together and ruin your nebula affect. That’s it! Now your Nebula in a Bottle is finished! I love just staring at this bottle. The colors and swirls are so pretty. This bottle ended up as a decoration in my son’s bedroom, ready for when I finish the space theme! You might want to glue the cap onto the bottle if a small child is likely to play with the bottle. I’d love to hear how you get on. What colors did you use? Please let me know if the comment section below. How to Organize Your Life - Stop Feeling Overwhelmed!